Looking for something special? A hotel directly next to slope yet centrally located? Then welcome to the 4-star superior hotel eva,VILLAGE. 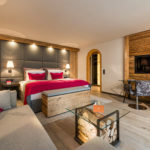 It’s the perfect hotel for an exciting but also relaxing holiday in Saalbach. 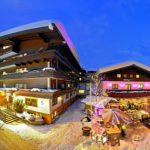 Situated within easy walking distance of all the main lifts in Saalbach. The 4* superior hotel is family run with friendly staff who are keen to make your stay enjoyable. Rooms are furnished to a high standard in a modern-alpine style. Halfboard includes a healthy breakfast, afternoon snack with cake and a 5 course meal with salad bar in the evening. Lovely Spa area consisting of swimming pool, sauna, steam room and more! A Village to experience. A place that feels like home.